The old Potter Schoolhouse stands shoulder to shoulder with Bodega's other iconic structure, the St. Teresa of Avila church. 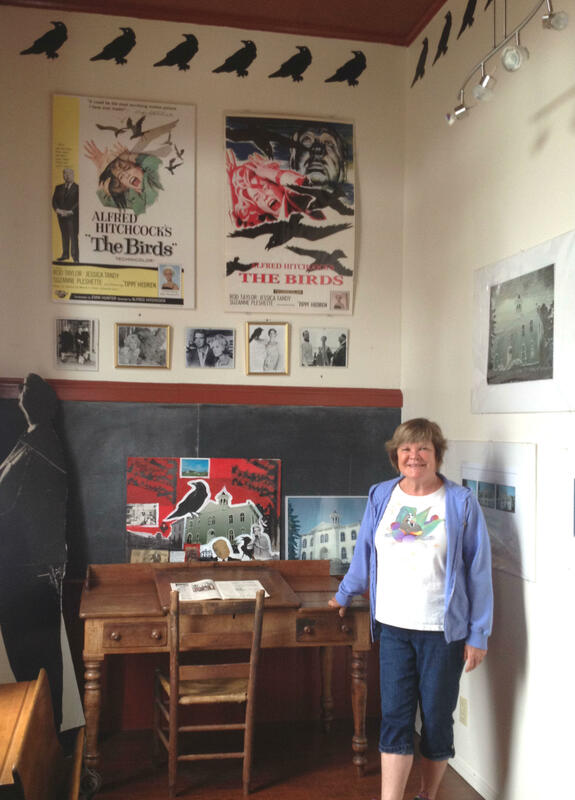 Leah Taylor shows off artifacts, both educational and entertainment related, in a one-time school classroom that was featured in the 1962 film, The Birds. The classroom scenes in The Birds make those rooms easy to recognize, even now. But Taylor says the large upstairs room—which once served as Bodega’s town meeting hall—also played a lesser known role in the film. Leah Taylor will be leading three tours of the historic school house tomorrow, as a fund-raiser for the Sebastopol Community Center. Find details and make reservations here. Or call (707) 823-1511.